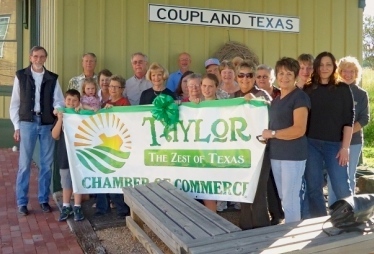 On October 23, the Coupland Civic Organization and the Taylor Chamber of Commerce held a ribbon-cutting ceremony to celebrate the CCO joining the Chamber as a non-profit organization. The Chamber provides its members services such as publicizing their events. Thomas Martinez, president of the Chamber, and Barbara Piper, CCO president, made brief remarks to the group. Barbara actually cut the wide green ribbon with a pair of giant scissors. Several other representatives of the Chamber attended, as well as some CCO board members and other community members. The Coupland Civic Organization (CCO) celebrated ribbon-cutting ceremonies with the Greater Taylor Chamber of Commerce this week. Participating were (front row, from left) Cole Kennedy, Caitlin Kennedy, Susan Schmidt, CCO President Barbara Piper, Brenda Witbrodt, Janie Czimskey, Susan Garry, Becky Sutton, and Sandra Wernli. Also in attendance were Jack Piper, Cole Barton, Buz Garry, Susan H. Garry, Don Wernli, Mike Schneider, and Marianne Schneider. Representing the chamber were Chamber President Thomas Martinez, Tim Tebeau, and ambassadors Joe Burgess, Pat O’Brien, and board members Isabella Tebeau (Eulenfeld Interiors) and Nancci Maloney. This entry was posted in Business, What's New? 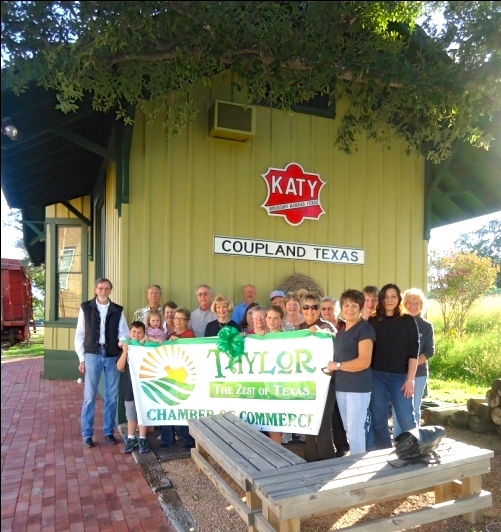 and tagged Coupland Civic Organization, Taylor Chamber of Commerce on October 27, 2013 by Susan Garry.